Dashboard — Shows your upcoming milestones, tasks, and events across all your projects; also shows you what your project member have recently accomplished. Project Workspaces — Switch between all of your active projects. If you have more than 10 projects, your last 5 most recently accessed projects will be listed at the top. Reports — Access simple but powerful reports. 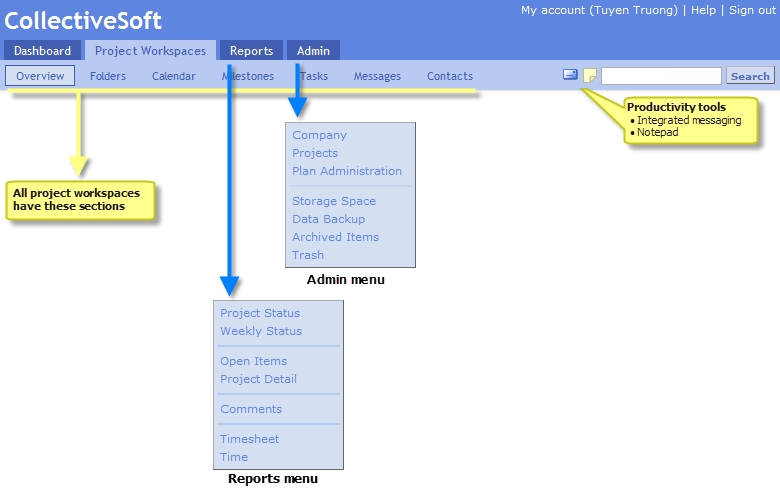 Admin — Access to administrative features. My Account — View your profile, edit your personal information, modify your preferences, and change your membership plan. Help — Get contextual help for the page you are currently viewing. Sign Out — Sign out of TeamWork Live. Search — Use to search the items in your workspaces or to search the help pages. Project Status — See the status of your projects. Weekly Status — Run your status meetings more efficiently. Open Items — See the open milestones and tasks for a project member or a project. Project Detail — See all the milestones and tasks for a project. Comments — Keep on top comments that have been added across all of your projects. Timesheet — Track where your team members are spending their time. Time — View details of time spent on tasks and projects. Company — Setup and manage your company. Set preferennces, brand the site, and create user accounts. Projects — Create projects and invite users to them. Plan Administration — Manage which project members are in your group plans. Data Backup/Export — Backup/export your data in multiple formats (pay plans only). Archived Items — Items that are no longer relevant (such as completed tasks) can be archived. You can view archived items from here. Trash — Items you delete are put in the trash for 30 days. You can undelete accidentally deleted items from here.